Personality: Affectionate, precocious and "in your pocket" friendly. I shouldn't play favorites, but with Leilani I just can't help it. Not only is she a fantastic milker but she has a great personality and is often my shadow around the barn. 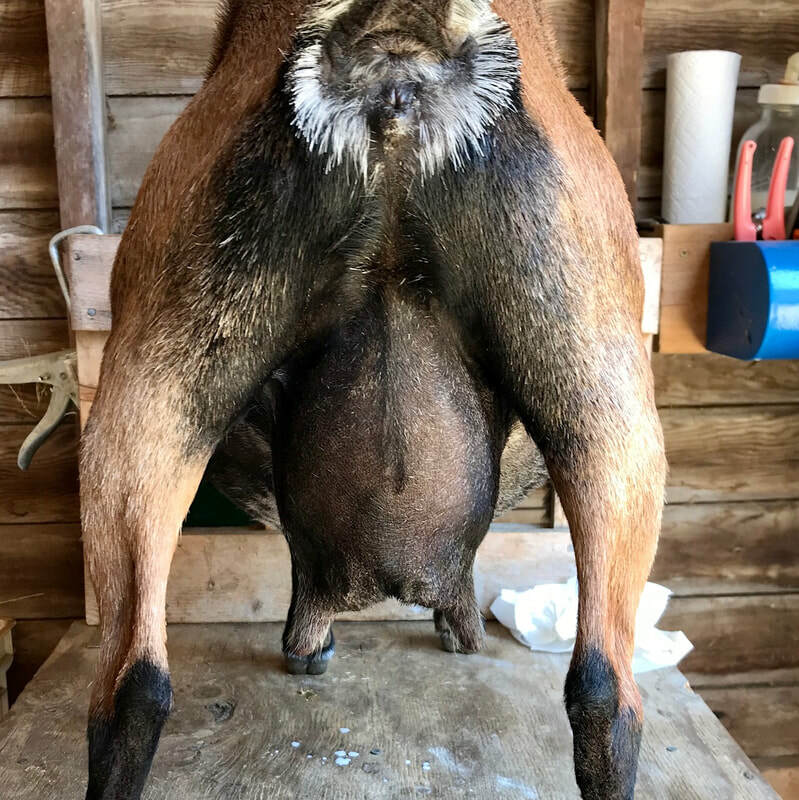 Multiple top ten milkers in Leilani's pedigree! She milks like a dream with nice size stretchy teats, open orifices, great attachments, butter soft udder texture and great capacity for her tiny size. We joke that she is our mini jersey cow, peaking at over 4.5lbs a day on a non performance diet of free choice grass hay, Chaffhaye twice a day and one cup of oats once a day. She is our hardest doe to dry off, with a wonderful will to milk. Add to that she is an angel on the milk stand, always eager to be milked and patiently calm. Leilani's kids always ended up being my favorites, so over the years I gave in and selected our doe herd down to focus on her line. 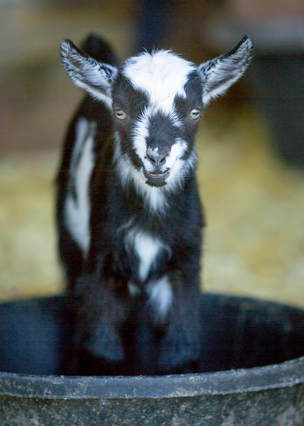 They are the whole package - quality genetics, easy to milk, hardy and super personalities. Leilani is now a happily retired GG Grandmother who, despite her age, is usually the instigator getting all the youngsters riled up to play with her. Personality: Sweet, friendly and quiet. Named after the Hawaiian goddess of the sea, Maka is a nice improvement in length and width over her dam. 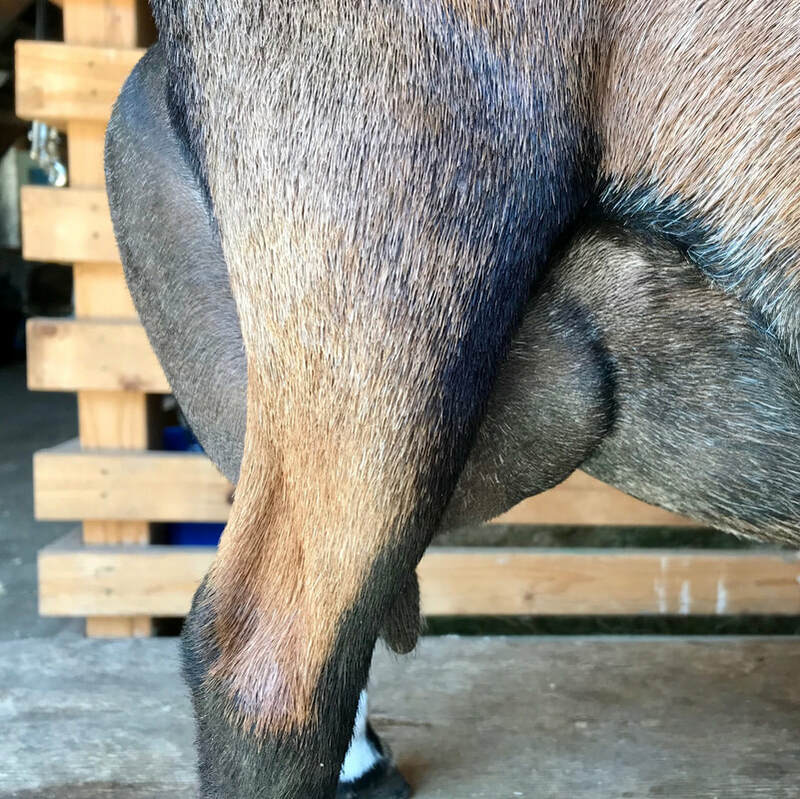 Standing straight and wide between the hocks, this lovely doe also stands on the easy to maintain hooves that I strive for. Slow to mature, she had a steady but not very capacious first freshening in 2018. It is wonderful to see her blossom this year with a much more capacious second freshening. 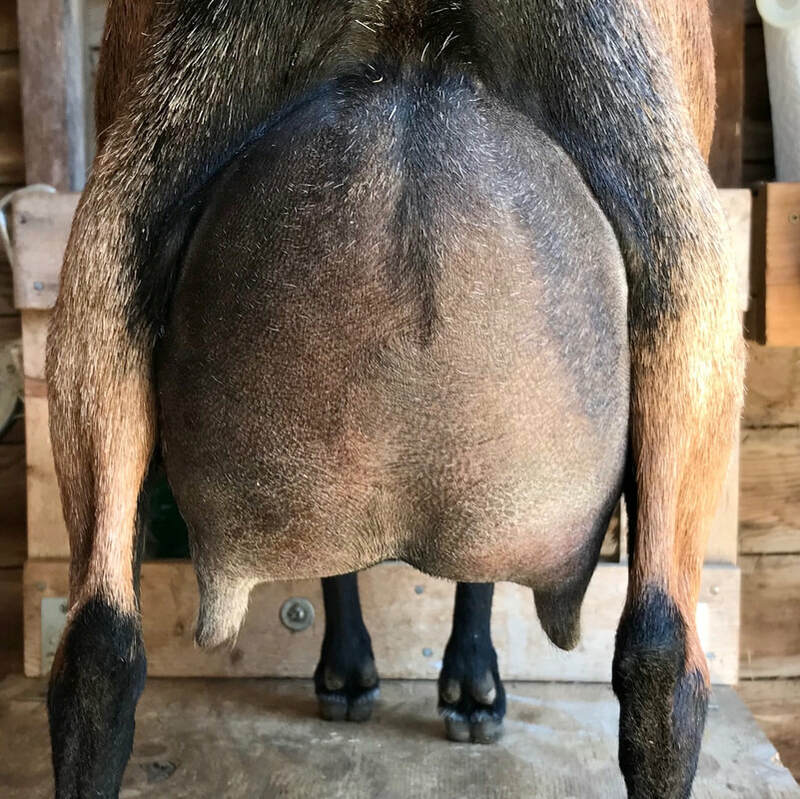 She has a beautiful udder with easy to express teats and a strong area of attachment. I am happy to see how easily she carried and kidded triplets, delivering all three in 10 minutes with no drama and wonderfully sensible mothering skills. Traits I value highly. Maka will be appraised again in June and is on milk test this year, I expect her to easily earn her star. Personality: Very sweet, friendly and quiet. 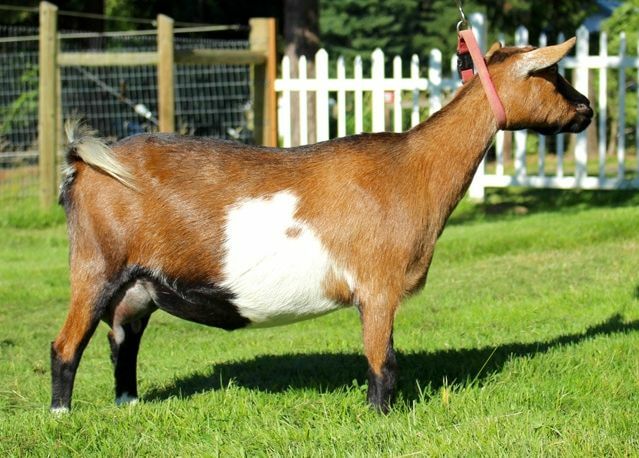 This lovely doeling is long, very feminine and dairy with a nice brisket, front end and high escutcheon. Sage is really stamping his look on his daughters. I wish I could keep them all but I have to limit myself and Maile may be for sale this summer in milk, possibly paired with a kid at her side. She is bred to R Serenity OMF Hunter's Moon, an Old Mountain Farm Frankincense son. Photos will be updated at the end of May after she freshens and she will be on milk test as well as appraised in June alongside her littermate sister and dam. Personality: Friendly, confident and quiet. I really love this doe, as soon as she hit the ground sopping went as a kid, I took one look at her and said "Yep, you are staying!" She is super easy going and when you put your hands on her she just sets up and stands still. While I don't show, she makes me want to get her in the ring. Her look-a-like 2019 full sister Lilikoi has the same awesome temperament. Moana is long bodied, very dairy with a nice brisket, front end, high escutcheon and wide rump. Photos will be updated at the end of May, after she freshens.